After more than a few comments about the amount of shows I've seen lately, I've started a new section on my blog called "Next Up NYC." 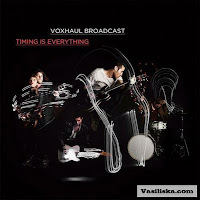 It will highlight an upcoming show I'm planning to see and why -- Voxhaul Broadcast being the first to be listed. On Tuesday, April 19th they will play the tiny Gramercy Theatre with Rooney before touring with Airborne Toxic Event in May. This band decribes themselves as a mix of psychedelic/rock/soul with a raw, rockin' sound. Their song, "Blackout" is getting lots of airplay on kcrw.com's "Morning Becomes Eclectic" and I'm eager to experience it all live. My hero and former Musical Director of the show, Nick Harcourt, has declared the group one of LA's "Best New Indie Bands." The new release, Timing is Everything, was proclaimed as "New & Noteworthy" on itunes and can be heard in its entirety on bandcamp here.